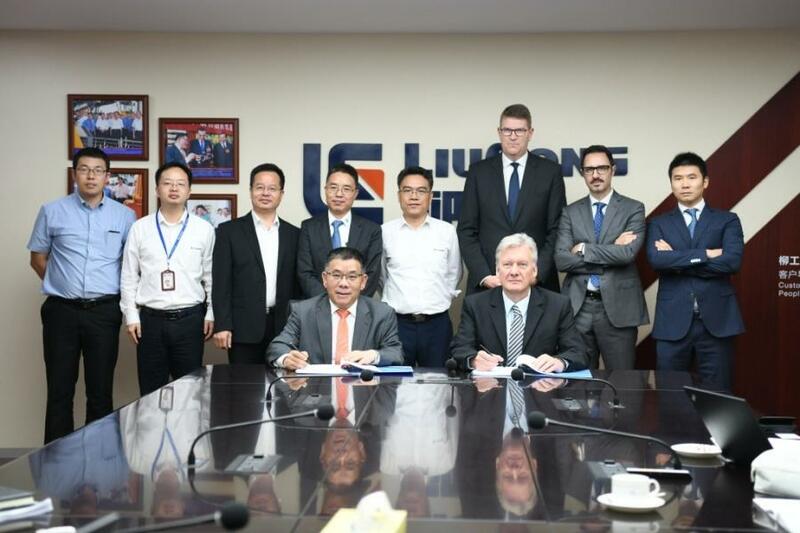 Chairman Zeng Guang'an of LiuGong Group presided over a BOD meeting at Liuzhou ZF Machinery Co., Ltd (LZZF), a JV of Guangxi Liugong Machinery Co. and ZF Friedrichshafen AG, in which the 2 sides signed an agreement to confirm the manufacture of a new generation transmission of the BP230. On April 23, 2018, Chairman Zeng Guang'an of LiuGong Group presided over a BOD meeting at Liuzhou ZF Machinery Co., Ltd (LZZF), a JV of Guangxi Liugong Machinery Co. and ZF Friedrichshafen AG, in which the 2 sides signed an agreement to confirm the manufacture of a new generation transmission of the BP230. The agreement will enable LiuGong to have its own world-class transmission product. The BP230 is developed from ERGOPOWER, but innovatively adopted multifunctional components and a front-back split structure, both tailored for Chinese users' habits, making the operation more comfortable and assembling & maintenance easier. Compared to the old generation product, the new transmission is of a smaller size, but it has stronger output and can help the machine to reach a faster speed at the same capacity to obtain better performance. The compact size is better adapted to the torque converter. Meanwhile the improved speed ratio and its standard Automatic Mode can largely reduce oil consumption. The interior of the box is driven by the helical gears, ensuring a stable driving and lower noise. The shifting comfort is also improved by a new proportional valve that is commonly used in cars and optimized controlling programs. Through a highly integrated design, the electro-hydraulic controlling system can monitor the working condition of the gearbox remotely through GPS, and realize fault diagnosis from afar, making the maintenance easy and convenient. The transmission can be widely used in wheel loaders and graders, such as LiuGong's 856H, 862H, 870H wheel loaders; options of 4-speed and 6-speed automatic gearboxes are available. It is an upgraded product for the WG200 and a replacement for the imported EGROPOWER transmission; creating great potential in the market. The launch of the new transmission extends the product lines of LZZF, providing more choices to users and creating more value for them. Meanwhile, it enhances the company's competitiveness and lays the foundation of a long-term development. The product's R&D began in 2016 at LZZF and a total of 15 prototypes were produced successively for reliability tests. The product will be officially launched soon and is expected to begin large-volume production in November 2018.